(Bloomberg Opinion) -- Sunday's municipal elections in Turkey marked a resounding rejection of President Recep Tayyip Erdogan's ruling AK party in the nation’s big cities. 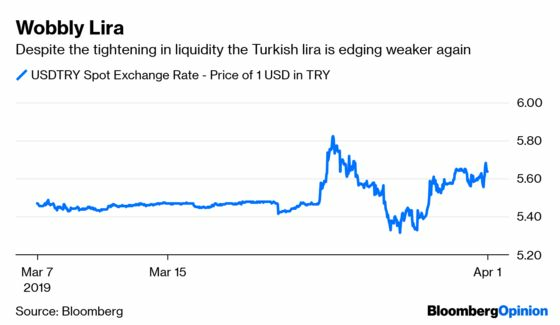 The political fractures may make it harder for the lira to recover recent lost ground. The currency weakened by as much as 2.3 percent on Monday. 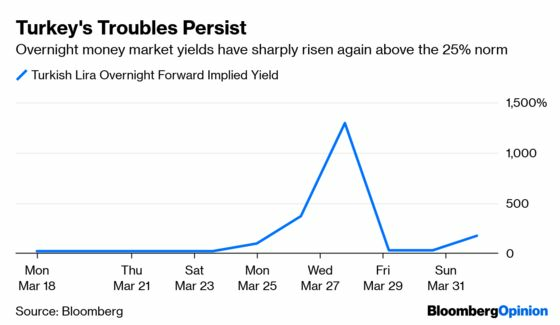 What is most troubling is what accompanied that fall: a spike in overnight rates to as much as 300 percent. This suggests the screws are getting turned again in bank funding markets, and the flight from the currency continues. The central bank had suspended its daily auctions of one-week money on March 22 after an unexpected drop in the nation’s foreign currency reserves pummeled the currency. Moody's Investors Service highlighted the problem on Monday, saying the fading reserves are negative for its credit rating, currently B2 with a negative outlook, the lowest of the main agencies. This plan to rescue the currency worked, but at a substantial cost. The move produced a massive increase in banks’ short-term funding costs. Overnight rates – which become the only valve for liquidity if the one-week window is closed – shot up above 1300 percent at one point last week. They returned to the more normal level of about 25 percent by the end of last week, as the clamp down on Turkish banks conducting business with foreign counter-parties appeared to have eased. That respite seems to have been only temporary. Banks are again among the worst performers on the BIST 100 Istanbul stock exchange, which has recovered only a little of the 10 percent lost since the crisis erupted. This is another blow to the reputation for Turkish markets. Foreign investors find themselves trapped, able to neither buy nor sell. The key to restoring normality in Turkish financial markets will be the reopening of the one-week money auctions. After this, liquidity needs to return across a fuller range of maturities. As things stand, funding is only really available for one or two days, and at exorbitant rates. It had seemed that, once the election was over, financial management could return to normal. The hope was that perhaps officials would be less sensitive to currency volatility. However, Sunday’s result was an historic one for Erdogan, as it was the first time in more than two decades that he lost some of the country’s big metropolitan areas. It remains to be seen how he takes it. At the very least, he still has every reason to keep the foreign exchange markets in his sights.